When many ask, “Why can’t ‘they’ wait in line like everyone else?” I don’t think that they know the history of Mexicans in the U.S. Or if they do, they don’t bother to understand how it is on the verge of repeating itself as a result of our economic crises. And on the other side, some Latinos under the Obama spell, fail to notice that “their President” is on course to repeat a pattern in history that aimed at lessening the population of Mexicans in the U.S. In the 1920s, when the U.S. hit a prosperous height, it also quickly succumbed to a depression that rattled the banks and faith of the many U.S. Citizens. 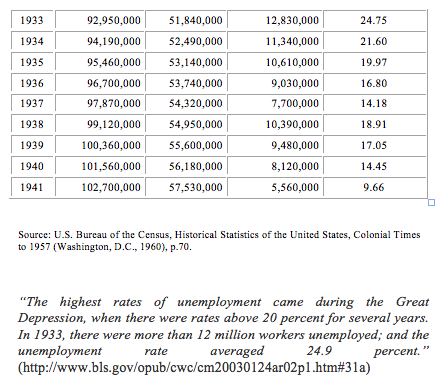 As in our current standing of unemployment at 8.2%, the U.S. was on the cusp of a deep and worrisome depression as the unemployment rate hovered at 8.7% in 1930. As a result, America sought answers on how this prosperous nation could go into a deep slump. In an effort to appease the masses, the answers to the slump in economy and unemployment included the Mexican population, an expendable and vulnerable group. In the chart below, note that the unemployment rate started to increase in 1930 at 8.67% and then sharply rose to 15.82% in 1931, and 23.53% in 1932, and so forth. The Repatriation began in 1930 and lasted for the decade. The Repatriation sought to push the Mexican population to exit the U.S. in hopes that the labor force could be controlled. The idea was that unemployment could be controlled if low skilled jobs could be created by replacing those already working in them with deserving U.S. Citizens. These businesses, thinking that they were patriotically helping America, succumbed to the rhetoric and action by the Federal Government, States and Unions. Many businesses laid off workers, and then feeling shameful, attempted to help them leave the U.S. Mexicans, who were also U.S. Citizens, were accused of siphoning the benefits that “Americans” were entitled to, but they were also deserving recipients as U.S. Citizens. Unable to sustain their families and the deplorable treatment in the U.S., many chose to leave the U.S. with their families rather than sustain repercussions of an unfriendly environment. Under the FDR Democrat Administration, scholars state that at least 500,000 Mexican Americans were removed from the U.S., sometimes by force. Records at the Mexican Embassy show that between 1930-1935: 345,839 reported themselves to the authorities as they left the U.S. In the book, Decade of betrayal: Mexican Repatriation in 1930s by Francisco Balderamas and Raymond Rodriguez, they describe how U.S. Citizens, who were of Mexican descent, unable to find the ability to return home, turned to their Churches for assistance. Thus, the sanctuary of safety became a theme for Latinos to this day. According to the article, scholars often talk about the immigration to the United States but only until recently, the 1980s, was the emigration (leaving) of Mexicans from the U.S. even mentioned. The only printed article in 1932 was titled, "The Mexicans Go Home" by Edna E. Kelley appeared in the Southwest Review. During this long decade of the depression while the Democrats ruled the U.S., it was FDR who created socialist programs that he believed, and managed to convince the masses, would stimulate the economy. Consequently, he was also allowing the fear rhetoric and oppression of the Mexicans. He furthered the fuel of fear, by adhering to the Unions who were adamant about saving jobs that they believed Mexicans (U.S. Citizens) were taking over in the agriculture sector. The public was duped into believing that getting rid of the Mexicans who were “leeching” off benefits that rightly belonged to U.S. Citizens. According to the present Obama policies, if you were born in 1950 and before, you are expendable in the U.S. Your absence, along the Rio Grande Valley where you have lived most of your life, will be overlooked. According to this Administration, Latinos have an apathy and will not participate in elections, and so invalid deportations and stripping on U.S. Citizenship will go unnoticed because no one will dare to speak up to this injustice. The similarities between the 1930s Repatriation and the present Obama Deportations, not to mention the stripping of citizenship from Latino U.S. Citizens is a cause for concern. 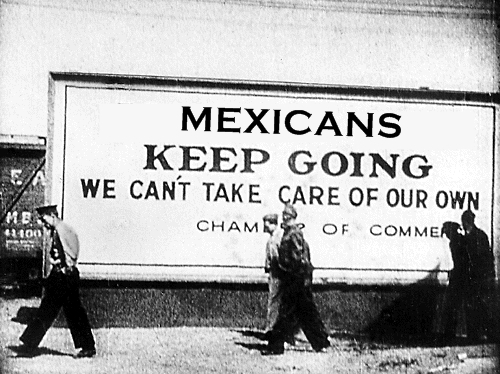 In the 1930s, while the country nurtured a culture of dependency on the social programs, the U.S. Federal Government continued to oust Mexicans, certain that they were they cause of the depression. Recently, Obama has added a new health program that will create a culture of additional dependency, but will also magnify the low skilled worker as the largest beneficiary of the program, who happens to be the Latino. Obama also talks about increasing government programs to equalize the opportunity of those less fortunate with those less wealthy, pitting the wealthy class against the less fortunate, again the Latino. In the 1940s, when the population drained itself of workers with World War II, the U.S. made efforts to retrieve the working pool by way of the Bracero Program that began in 1947 and lasted until 1964. It was during this time that Mexicans were able to return to the U.S. and reclaim a life that had once been theirs in previous decades. However, labor unions at this time, began to once again blame the Mexican Population for unemployment and once again they were ousted and sent back to Mexico. At Present, what is the plan that the Obama Administration intends to feed to the Latino community, while continuing to play into the hands of unions all the while keeping his distance from protecting the community from questionable detentions? It is as though all of the progress made by Latinos since 1964, when they again entered the U.S. is about to erased by these deportations and questioning of citizenship under the Obama Administration. For those who utter hate toward a community that has been unjustly ousted from their country, take note of history and its disgraceful actions. And for those Latinos heralding the current Administration and President as a hero, be mindful of your history. While the United States must maintain a healthy economy, it must to so with the opportunity to maintain a productive populace in an humanely manner. In doing so, those who have earned their U.S. Citizenship, and are valuable to this country cannot be targeted as a scapegoat, again. U.S. Citizens who are culturally Latinos/Mexicans must step forward to protect themselves and their community. The new Repatriation under the Obama Administration must be halted so that Latinos are not placed in the center of blame for a declining economy. Unlike the time of FDR, Latinos have power with their vote. They must remember to use it to ensure that the shameful ousting that Mexicans experienced during the decade of shame is not repeated, ever.